Back again to Tamil, our melody queen recording lots of song in south Indian languages, so clear pronunciation, hats off to her. So SHREYA DI did a solo for the film "ooh la la laa" composed by Shekhar chndra and V Kumar. Am sure it must be having something very special as its sung by SHREYA DI, so lets find out .. The song starts with the tune , just hear that you can find the essence of south Indian music. Soft , slow and good tune was playing before SHREYA DI started, on 23rd sec. Again so sweet voice, touched my heart again . Hope she didnt take much pain or strain in singing this, she sang this with absolute ease. I am telling you because the song reflects all this. It can be called as a slow song. Much enjoyable ! There is something in the songs which pulls the heart towards itself, its called hidden beauty. Music sounds bit old and new, mix :) The ending of the song was very good. So here is a kannada song sung by our melody queen in the film " Matthe Mungaru " . its a duet sung by SHREYA DI and karthik. Music is composed by X Paul Raj . This is again a beautiful sweet track. Lets discuss about this now . The song starts with some attractive music with some effects , absolutely new style. After the 25th sec the tune got became normal and continued for some more seconds. On the 33rd sec SHREYA DI started singing with her heart catching attractive , sweet voice with "chitta pitta" . Voice was more clear as the music was mild, superb. The male singer got his chance on 46th sec. 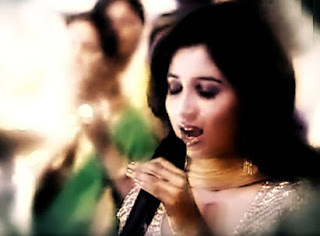 Again on 1.06 min SHREYA DI got back with her super sweet voice, added loads of sugar to the song! :) This is now a slow track neither a fast one but its pace is appreciable , smooth flow. Female singer got lil more chance to sing in this, thanx to the music director. I love her when she used to pronounce "CHITA PATA PATA" in this track! also love her rendering "pal pal pal har pal" on 3.48th min. I guess this is a love song with cute lyrics. Nice music pieces were being played in between. At 26, she’s already one of the leading playback singers of the country and her four national awards prove that there’s no fluke in it. In the city for her first public concert, Shreya Ghoshal talks about her journey from a Bengali girl-next-door to Bollywood’s music sensation. The singer who catapulted into the limelight when she won the Sa Re Ga Ma Pa contest naturally favours reality shows. “These shows are not just talent hunts. They are TV programmes too and hence are packaged with masala and emotional content. While the SMS system may not necessarily recognise the most talented participant, the exposure with millions watching one performing on TV for so long is always there. A lot of contestants are doing concerts, if not singing in films or recording for private albums. Success comes to everyone who makes it to these TV shows,” she says. She has, in fact, a day dedicated to her in the US state of Ohio and that puts her right next to Swami Vivekananda and Rabindranath Tagore. “It was a surprise to be bestowed with the honour of June 26 being declared as Shreya Ghoshal Day in Ohio,” she says. SHREYA DI got nominations in IDEA BIG BANGLA MUSIC AWARDS !! Again our melody queen got nomination in a prestigious award ceremony, its 'IDEA BIG BANGLA MUSIC AWARD 2010" . I am glad that two of her most popular bengali songs have been nominated . Feel extremely proud to inform you all. 1st nominated song is "JAO PAKHI" from the movie "ANTAHEEN" sung by "SHREYA GHOSHAL" and "PRANAB BISWAS". This was composed by "SANTANU MOITRA" . 2nd one is "PHERARI MON" from the same movie. Hey all our melody queen now back with a solo from the movie " Aashayein " . The tracks are directed by Salim - sulaiman , Pritam and Shiraz Uppal. There are 9 songs and 4 remixes in this movie. The music released yesterday i.e on 26-july-2010. SHREYA DI has only one song i.e "PAL MEIN MILA JAHAN" which has another male version sung by Shankar mahadevan sir.So lets move and lets talk about the song. This Track is composed by Salim-Sulaiman, this track is the saddest song in the whole film. It was sung beautifully. We can find a lots of feel , throughout the song. The track directly starts with "SHREYA DI's" voice , she starts with "pal mein mila" with slight and light music playing in the background , voice was very clear. On 30th sec the singer caught higher notes and beautifully got back . This is also a slow track full of emotions ! Sad tunes were being played in the backgroung. More than 60% of the lyrics contains this line "PAL MEIN", awesome composition. The full song was in sad mode and was trying to express what has happened ! It reminds the kind of composition earlier. This song is about finding happiness and loosing it. Hats off tho SHREYA DI for singing this kind of sad songs again. Thankyou loads for this song, its now very close to me as other songs . Lyricsists - Mir ali Husain, Sameer,Kumaar,Shakeel Sohail. pal mein yakeen tha, ab guuma pal mein. 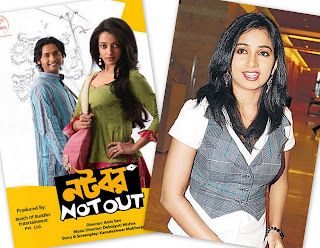 Again a new post on a bangla track "Megher Palok" , its a solo sung by most talented singer " SHREYA GHOSHAL " from a Bengali movie "Natobar Not Out". Track is composed by "Debajyoti Mishra". We are now getting a lots of bangla songs one by one in series by our melody queen, hope we get more and more. So lets move ahead and continue reviewing. This is a love song , track starts with amazing sweet music with some effects inbetween. smoothly sung by SHREYA DI, with absolute ease , without any flaws. Again its a slow and soft track to hear. Shreya Di starts singing on 37th sec, the flow of the song was very nice. Many appreciable moments came inbetween. Beautifully sung. This song reflects the story of two lovers and their love story. Nothing more to say about this track, play it and enjoy its sweetness . This track is a solo and after many duets of SHREYA DI we gots this. This Tamil song starts with SHREYA DI's voice with " aaa aaaaa ". On 35th sec she continued the song with " kannanai thedi" , was awesome. The track got fresh and sweet voice, LUCKY TRACK :) This is also a slow kind of song but really you can enjoy it, feel the feelings in the track. I feel as if this is a PRAYER SONG or a worship song. We can catch some names of god being rendered by her , but the language is Tamil. I hope you all enjoy voice, singing and music , not the language. You can just shake your head and enjoy. its beautifully composed and sung. Both the composer and singer worked hard , and you can see the output too. :) The tunes or the music being played sounds as if its being played for some " pooja or aradhana " . I hope i am not wrong. But the track is really superb. Loved it soo much. This Radio mirchi conducted first leg of mirchi music award 2009 on 17th July in Chennai. The awards recognised talent in four languages - Kannada, Tamil, Telugu and Malayalam. In Kannada , our melody queen won the award for "Na Naguva Modalene" from the movie "Manasare" . This track was composed by "Mano murthy". SHREYA DI too won "Suvarna film awards" for this song some months ago. So this song is a big hit, awesome. This album also won "listeners choice award". In Malayalam, again SHREYA DI grabbed one more award for the song "Chanthu Thottille" from the movie "Banaras" . This was composed by "M Jayachandran". This "Banaras" was honored by Album of the year. And SHREYA DI's song - "Madhuram Gayatri" became the song of the year. 17th reply from SHREYA DI ! Hey guys i am lucky enough to get my 17th reply from our melody queen. I was struggling lots to get a reply, finally succeded . Many other fans too got her replies. She was online for a long time. Hope i get even more in future ! Komaram puli - DOCHEY !! This track is sung by our melody queen and Lady kash n krissy. The song starts with regular assembled beats , in pairs. The other singer contiued , and i felt as if it is a remix. Inbetween you can catch some effects added with beats and music to make it more lovely. There was a beautiful short span humming by our melody queen on 24th sec. On 29th sec SHREYA DI starts with "DOCHEY" . Thois was something new , especially the way of singing. Hats off to SHREYA DI. This was the hip hop style of singing , which we rarely get to hear. On 1.36th sec SHREYA DI got back to sing slow and steady. The song was more dependent on beats even more than music. This is the uniqueness of the composition . SHREYA DI's fresh and attractive voice sure gonna achieve success through this song. I just bow my head infront of ARR n SG. hats off to Lady Kary n Krissy too. I want to thank Rahman sir for choosing the right person for this track. I really hope to see this combo doing magic together. God bless you both. One of the most celebrated playback singers of the indian film industry will be go Auckland to present a sterling evening of melody , fun and entertainment. SHREYA GHOSHAL , arguably the most resplendent singing star of the present day cinema , will mark her debut under ABC Entertainment and perfect harmony production private limited banner at Telstra clear pacific centre in Manukau city on August 20. Shiv prasad, another winner it the sa re ga ma pa series , stand up comedian and a band of musicians will join her go presenting the concert. Her ability to evoke the sentiments of the song sequence , bringing forth the vicissitudes of human emotions go her voice has seen SHREYA'S meteoric rise go less than 10 years . Beginning with Devdas , a colossal multi starrer for which she rendered 5 songs , including bairi piya and dola re dola , she rendered hundreds of songs for almost all frontline music directors in the industry. Ilayaraja, the first asian composer to score a symphony for the royal Philomomic orchestra in London described her as " A talent so rare that it needs celebration ". If SHREYA was stunned at she stupendous calibre of the music director , she did not hide . She rendered a song for Illayaraja for debutant director Katha Thiramavalavan's Tamil film Ajantha, stated to be the first film to be shot in tamil , telugu , malayalam and hindi . " I am very privileged to work with this grand master of music . He composed 9 songs for each version - that is a total of 36 tracks in 1 week . More than a music director , he is an institution ," she said . Her list of films is long , and the scores are longer . But music buffs would say that some of her all time hits should include Teri ore ( singh is king) , main agar kahoon (om shanti om) , salam e ishq (title song) , ye ishq hai (jab we met) ,zoobi doobi (3 idiots) , oh my love (amanush) and un perai sollum (anagaadi theru). As well as hindi and tamil , her mellifluous voice has been heard go a number of other indian languages including assamese, bengali, malayalam , marathi and punjabi. Like her seniors in business Sonu nigam, Shaan and Sunidhi Chauhan , SHREYA'S forray into playback singing took the sa re ga ma pa route. But it began when shreya saw a porter in Rawatbhata, Near kota in Rajasthan, where she was raised , announcing a national level music competition in Delhi . "I was just 10 years old then (1994) . For the first time , i stepped out to land in the competitive world . I didnt win , i was ofcourse sad , but convinced myself that i would try again . I went on to win sub junior title at the next competition ," she said go an interview . SHREYA credit the late Kalyanji for honing her musical prowess . Following her episods in sa re ga ma , the famous composer , taught her the nuances of music , despite his chronic aliment. She recalls with gratitude his parting advice : " dont go with show business . You have talent . Pursue Saraswati , lakshmi will follow. If you pursue they will desert you ". Hasa SHREYA betrayed her master? "Not at all" , she said adding " i never take on too much work , because then the purity of voice is lost. If you are stressed and disturbed , it will show in your singing. You have to be honest and sincere about your music , not anything else . You have to be on the water and not be drowened . If you get carried away then you are gone. " This 26 year old says neither the fame nor the numerous honours that she has attained , including national film awards  , filmfare , filmfare south  , Interbational Indian film academy  , Zee Cine  and star screen . "My music is beyond films and playback career. I would not be worried if i dont get a call. Experimentation today is only limited to finding exotic., new textures, voices and timbers. indian film will never say no to indian melodies. I would say i have good chance. Flavours might keep changing but the heart of music is same , " she said. Hey guys i got 2 replies by SHREYA DI in one day . I was fortunate enough to get this ! This happens very rare with fans to get replies go pairs or bunch . Many of her fans got that too before me . I got this replies on 12th july at around 8 pm . That day i think SHREYA DI was very happy and she only decided to reply all . I got very excited , she asked for 1 hour break , till then i finished my dinner and started tweeting ! After some time di updated " now shoot !! " and just after that i was the first one to get her reply . Many of her fans got her replies and many were not much fortunate to get even one . Got the other after sometime and i was on cloud nine . Ogo bondhu sundori is a new bengali film starring acclaimed Babul Supriyo a leading movie hero role for the first time . The 1980 movie Ogo bondhu sundari remains a bengali film classic . Music is composed by Bappi lahiri. Our melody queen is back with her mother tongue again . The title track is a duet sung by SHREYA GHOSHAL and Babul Supriyo. A mild music plays , soothing . Do the 31th sec Babul Supriyo starts singing . Our melody queen starts on 47th sec . Superb singing , awesome duet . Loved the flow of song , it was just flowing and flowing with ease. The bengali lyrics were very clear , was floating silently over the music . I guess limited number of instruments has been used to produce even more big output. Both the singers got equal chances to sing . From the start to the end the track was on a permanent octave , i guess lower octave . Fantastic work done by Bappi lahiri sir. I really appreciate the singing of Babul Supriyo sir, fabulous . And our SHREYA DI was even more better as always . Both did justice to the song. Star Ananda honoured SERA BENGALI 2010 awards on 9th july! Star Ananda, the most popular 24 hour bengali news channel, will felicitate eminent personalities at special ceremony, from diverse fields for their achievements that made the bengali community proud , nationally and internationally . The news channel has also made special arrangements for live telecast of its flagship serb bengali awards 2010 to be held at science city convention centre live from 6 pm onwards. This momentous ceremony has been growing from strength to strength each year and is an occasion which makes all bengalis keenly proud. The Muthoot group is the presenting sponsor of sera bengali 2010 while it is powered by Nerolac impressions . Star ananda aims at reflecting and catalyzing the growth and resurgence of bengal . And also contributes to this process through this innovative programme . Sera bengali is an earnest effort go this direction , as it recognizes individuals who have not only achieved excellence go their respective fields but have also helped bengal emerge into national as well as international limelight . Star Ananda , through Sera bengali is dedicated to the recognition and felicitation of those personalities who have made bengal proud and would continue to do so . Sera bengali is the truest effort go this direction to recognize those successful bengalis who not only have excelled go their respective fields , but have also helped go putting bengalis in global arena . PUBLIC LIFE- Justice Ruma Pal. The award winners have been selected after an in depth research by STAR ANANDA editorial team . it was a star stubbed event , starting with a grand felicitation ceremony followed by a scintillating entertainment show with enthralling performances by SHREYA GHOSHAL , prince group. This was the first chance for us to see SHREYA DI performing live . I want to CONGRATULATE SHREYA DI ! This award proves her dedication in music . She is great ! 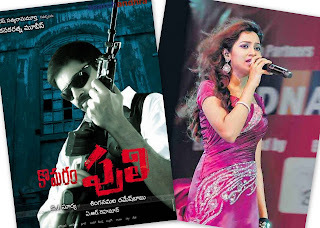 Again back with a new post, this time SHREYA DI jumped on Kannada again . Go this movie she worked with Karthik. The music is composed by Sai Kiran. Lets move on. hey guys again we will experience superb music and singing. The track plays little slow same as old film tracks but its simply awesome. SHREYA DI starts very soon on 29th sec , very clear, crisp , cute and sweet to hear ,as usual rocking ! Super cute singing by Our melody queen with slow music . This duet is very soothing . This is a kannada track . You can feel the music and singing , it moves straight to our hearts. Loved this song so much. great work by both the singers but our melody queen was great . The composer too did a good work in composing a track of length 4 min and 51 sec . This is a new track in Tamil from the film 'Thillalangadi' sung by SHREYA DI. The music is composed by Yuvan shankar raja. We are happy as SHREYA DI got back to tamil again. So lets discuss about the track. The track starts with awesome music. The track is a trio, sung by SHREYA DI ,Yuvan shankar raja and k s chitra. Chitra continues the track after the music, i felt as if her voice was not so clear to hear, the music was covering up her voice. This made me little dissapointed. Our melody queen starts singing on 1.02 min.It was a great start. The voice was clear. The track plays lil fast than the beats! Yuvan got his chance to sing on 1.56th min. We can also notice that the parts sung by SHREYA DI were mixed with beats and slight music but there was something different with Chitra and Yuvan, their parts were full of loud music . Track length - 4 min 58 sec. I loved the composition very much. Raja produced some vocal effects in between which was lovely and something new to find. K s chitra was equally good. But SHREYA DI was outstanding, awesome as usual. I hope you all will love this song. I loved it very much. Sorry for posting late. Our melody queen's twitter anniversary was on 10th july. She joined twitter on 10th july,2009. She completed 1 yesr on this day. Its her 1st birthday on twitter. She has also got her twitter account verified. Loads of love SHREYA DI, hope your journey on twitter continues with lots of smiles. I got this reply while i was tweeting her early morning . I got this reply as " shreyaghoshal@Abhishek_4SG hmmm. Also this still stays pending! Need a few days at home then will cook, play scrabble etc etc "
SORRY guys for posting this late, my birthday was on 7th july and i got 1 reply from SHREYA DI. She wished me saying " Happy birthday Abhishek:) " . Awwww so sweet of her and all her fans who are my friends. She wished me at around at around 10.30 am when i was in my classes. I was not aware of the biggest surprise which was waiting for me. All her fans and my sweetest friends on twitter tweeted SHREYA DI about my birthday and she wished. I was feeling as if i am at the top of this world, was extra happy :) Felt as if on cloud 9...! SPECIAL THANX to all her fans for wishing me and for tweeting SHREYA DI about my bday. And SPECIAL SPECIAL THANX to SHREYA DI. You all SG fans made my day...:):) GOD BLESS U ALL n SHREYA DI ! Small town talents make it big on reality shows! A platform to flaunt their talent in singing, dancing ,acting even cooking - reality shows are giving people in small towns across the country an opportunity to showcase their accomplishments, and if they make it to among the top few winners, a fairytale existence thereafter with fame and fortune beckoning . Reality shows are a rage in small towns. Sunidhi Chauhan, SHREYA GHOSHAL, Raju srivastav , Prashant tamang and Sandeep Acharya are the few name names that rose on the showbiz firmament after their stint in reality shows and their success has inspired many to follow suit. The first few reality shows that provided big dreams for small town people were "MERI AAWAZ SUNO" on doordarshan and Zee TV's "HERO HONDA SA RE GA MA PA" that respectively produced singers like Sunidhi Chauhan and SHREYA GHOSHAL in 1996. The small screen is knocking vigorously at the doors in small cities. Our melody queen got success which is a big thing for all her fans, relatives,family and well wishers.I Just want to THANK ZEE TV and all the JUDGES ! The censor board has given UA certificates to kanadda film SANCHARI .Kiran Govi directed this movie. It is a romantic thriller produced by D R Enterprises.Vijay Mohan has done the camera work . The film'smusic has been scored by the upcoming music director ARJUN.The songs of the movie has already become chartbusters. Bollywood playback singers Sonu nigam and SHREYA GHOSHAL have sung the track"GAYILE NODU BAA" in this film. The lyrics of the song have been penned by the renouned writer Jayanth Kaikini. The film has 5 songs composed by Arjun.